Horse Trials - Commonwealth Dressage & Combined Training Assoc. CDCTA moved the HT to Berryville,VA in 2016. CDCTA moved to Locust Hill Farm in the fall of 2005. Thanks to the generosity of Mike and Betty Long we hosted our Horse Trials in their hay fields twice a year, spring and fall, 2005 - 2015. Rebel Colony Award for Combined Spring and Fall Low Score (Same Rider and Horse in Novice or below) – ***No Fall HT*** Not awarded. ANOTHER SHOWJUMPING ROUND AT PEACOCK (Fall HT 11)http://www.youtube.com/watch?v=8pu6WgIHJLI– WE HAD TO MOVE CAUSE ROBINSON RIVER WAS FLOODED! Not so long ago we spent 10 years running over world class ground at the home of the Virginia Gold Cup - Great Meadow. Did you know that the first two years at Great Meadow we ran Dressage and Show Jumping at Commonwealth Park and XC at Great Meadow on Monday?Coleen Hersson was the new organizer for the new Preliminary and Intermediate Courses contested at Great Meadow. To the right is Noel Hersson and Wise Up Lil Susie jumping down the waterfalls during our inaugural run at Great Meadow. (In the words of Emmett Turner)The course at Commonwealth Park was originally training level only and was built for a USPC National Championship.The dates wereAugust 2-3, 1985. The Seneca Valley PC in Maryland was the overall organizer for the championships. Parts were divided out to other clubs andVA Regionmanaged the Combined Training section. Colonel Clarence Edmunds was head of the Ground Jury and Gen. Burton was the Technical Delegate. Seneca Valley ran an event there the next year, adding the novice course. They ran for3years until they had enough money to build the course they now have in Maryland. Dr. Scott asked me if CDCTA would like to take over the event. I said yes but it was too close time wise to the DRPC event so Janet Gunn was the first organizer. Then she and I alternated the spring andfall dates for a few years. 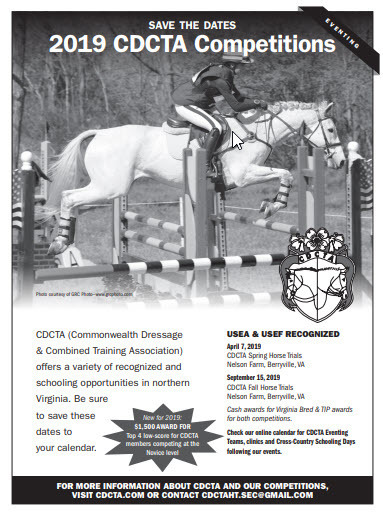 "...the major new activity for 1989 will be the organizing of the Spring and Fall, USCTA egistered,Commonwealth Horse Trials at Commonwealth Park in Culpeper. Seneca Valley PonyClub, which has run the horse trials since their inception is now concentrating on theirown event in Maryland and there wereno volunteers to take over the event. We feel it is important to keep these horse trials on the calendar,as the most centrally located USCTA event in Virginia."